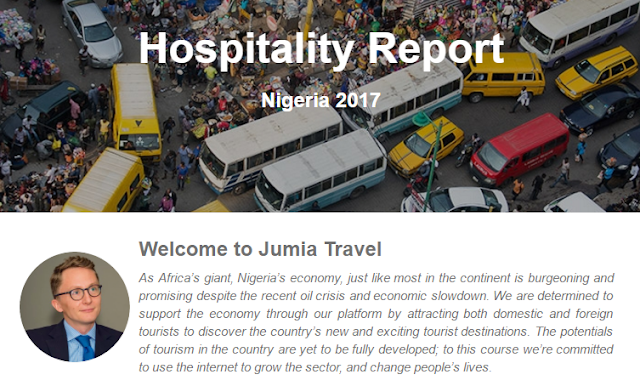 The Nigerian hospitality report 2017 which has officially been launched by Jumia Travel, has shown that the country generated 97% of its tourism revenue from domestic travel in 2016 while foreign travel accounted for 3%. Kushal Dutta, MD of Jumia Travel Nigeria stated this while overviewing the content of this year’s report at a press conference held at Four Points by Sheraton in Lagos. Dutta mentioned that despite the security challenges in the country and the fall in dollar exchange rate, a lot of Nigerians preferred to travel within the country to spend their holidays at exciting tourist destinations. “This is a good sign that we need to encourage a lot more travels within the country by designing attractive holiday packages that will be exciting enough for Nigerians to want to spend money on tourism within the country. As a company, we are interested in collaborating to encourage more Nigerians to enjoy their holidays within Nigeria”, he added. The 2016 report, which is the 2nd edition, captured the development, impediments, and impact of technology on the country’s travel industry between January and December 2016. “We have captured relevant data on the percentage of online booking over offline; most used tool for hotel searches; most preferred payment method; average price of hotels from highest to lowest demand in cities; percentage of hotel bookings by star ratings, as well as percentage of hotel bookings by amenities,” Dutta said. Similarly, Mr. Bruce Prins, a renowned hospitality consultant in Nigeria who was featured in the published report stated that the hospitality industry in 2016 suffered extreme pressure as a result of a reduction in foreign visitors and local corporate expenditure. The price war between many hotels undermined the hospitality industry’s perceived value, and also created a lot of degradation in so far as the quality on offer is concerned. Reduced services, and ill-maintained facilities contributed to the latter due to the price wars. “In 2017, there will be more recreational facilities, and services will be required; better reservation systems that are 24 hour, and easy to action will be the deal-breaker. Ease or disease of air travel will affect everything; renovation and maintenance will make a hotel, and the lack thereof will break a hotel; and social media is, and will be even more so the most powerful marketing tool,” Prins added. The 2017 report essentially provided data and insight on the Nigerian travel industry viz a viz the local sector with its counterparts on the global map.